I hadn’t played Ōkami in any of its iterations prior to this one, believe it or not. It’s been a real black spot for me, as a afficianado for everything to do with Japanese culture, art, and entertainment, and fellow fans of Japanese games have certainly been surprised when I’ve told them that I had yet to experience the wonders of Ōkami. Now, though, I can say I have played it, and in hindsight, I can’t believe it has actually taken me this long. This game is almost made for me. I should have played in its first release. Related reading: Another game that makes use of traditional Japanese art aesthetics is Oreshika on the PlayStation Vita. 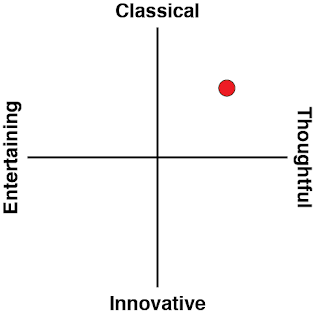 Our review of the game here. Actually, I know why I've been hesitant; Ōkami is so often chalked up as a “Zelda clone,” that I’ve been quite put off by it. I like Zelda games well enough, but not so well that I’ll automatically be interested in anything that is inspired by that franchise’s gameplay formula. The idea of playing an inferior copy of Zelda is more than enough to put me off playing a game, no matter how good it might otherwise look. I now know that those people who have been talking up the resemblance have been doing Ōkami a great disservice. Yes, the gameplay and level design vaguely resembles a Zelda game. Dungeons are a similar puzzle-weighted experience, and the very act of exploring the world has that same sense of wonder and joy; particularly when you see something curious in the distance, and then figure out how to reach it by manipulating the environment or the resources that you’ve got. There’s even an annoying little “helper” character that calls to mind Navi from The Legend of Zelda: Ocarina Of Time, which was very much the hero of the games industry back when Ōkami was first in development. So, yes, if you strip the game right back to its gameplay fundamentals, there is a superficial resemblance to the Zelda franchise. 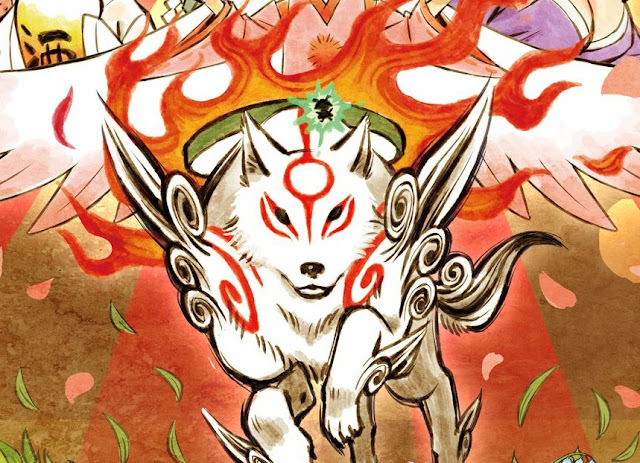 But in reality Ōkami is so much more than a Zelda-like. It is far more confident in being Japanese, for a start. Ōkami takes its art direction from a combination of different Japanese art styles, such as rinpa, sumo-e or ukiyo-e, where Zelda games generally angle towards a more commonplace fantasy art style. This gives Ōkami more than just a superficially different aesthetic. It deepens the game’s various themes and motifs, the process creating something that feels far richer and more narratively-dense as a result. Ōkami also draws on Japan's unique Shinto spirituality to tell a story that is so deeply and distinctly Japanese that it should be considered a cultural artefact. The protagonist of the game is a giant wolf, named Amaterasu. Amaterasu is one of the principle deities of the Shinto religion, and one related closely to nature and animals. In her normal form she's not actually a wolf, though Shinto gods being the beings of nature that they are, she can easily enough appear as one. She is the goddess of the sun and universe, and as such is seen as a key deity of life, goodness, and health. Indeed, she is so important to Japan's religious history that the very emperors of Japan were once considered to be direct descendants of Amaterasu, getting their mandate to rule without question from their divine link to the leader of their pantheon. 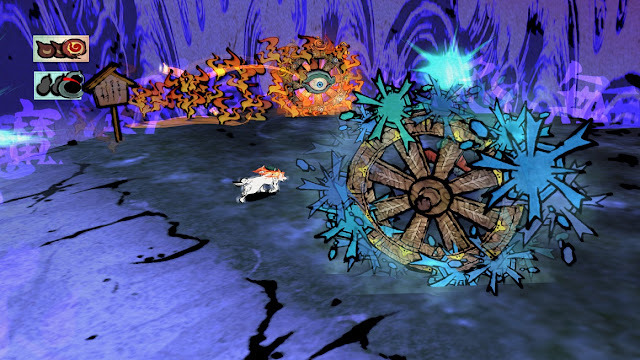 So, the Amaterasu of Ōkami is the goddess taken the form of a great white wolf – an animal that itself has incredible power in Japanese spirituality - and is given the task of pushing back a great evil that is infesting the land… often by the player literally drawing suns into the environment to purge the environment of inky black miasma. Once of Amaterasu’s key abilities is to stop time to bring up a spiritual “celestial” paintbrush, which can then be used to “fill in” parts of the scenery, add stars or the sun to the sky, or at other times, destroying objects or attack enemies. The general effect of all Amaterasu's activities, however, is one of restoration. Whatever Amaterasu and her great brush do, soon after trees grow again, blighted land is returned to green, the environment again teems with nature as an equilibrium is returned to the world. Amaterasu is less of a character which with her own distinct personality, and more symbolic of nature itself trying to close over wounds done to it. As though to reinforce that idea, our hero has greenery and flowers bloom at her feet with every step. In addition to being a beautiful effect on the eyes, it’s reinforcing a core tenant of Shinto beliefs - that the Gods and spirits of the world are nature first, physical entity second. Indeed, Ōkami has such a deep reverence for nature that it’s quite sweet. You’re encouraged to feed birds, monkeys and other innocent animals to build a relationship with them. The humans – the good ones, anyway – are typically portrayed of living in a simply, quaint, happy harmony with nature around them. The antagonists are forces of darkness, and a threat because of the harm they inflict on the earth and natural order, more than any tyrannical power they might crave over the built world. So clear is this game's commentary around environmentalism that it's almost more poignant now than it was when it was first released, and it can easily be "read" as a cry for humans to treat the world around them with more respect. So many of Okami’s other characters are also drawn from the centuries of Japanese spirituality, history and/or lore. Issun, the annoying fairy-thing that accompanies Amaterasu, is himself an important character in folklore. Another character is based on Abe no Seimei, an important priest who really did exist (though so long ago that his story is more myth and legend than anything provable). Himiko, the queen of Japan’s Atlantis – Yamatai - also has a role in the game. Indeed, the more you actually know of Japan’s religion, legends, and history, the more you’re going to pull out of Ōkami, because the game is so true to all those legends that it really does behave like a compendium of stories at times, and yet it never quite gets to the point where it starts to feel like it's name-dropping for the sake of it. For all the reverence that Ōkami has for its heritage and Japanese spirituality, it never stops being entertaining, either. There’s a pitch-perfect sense of humour around the lovably hopeless characters that Amaterasu encounters along the way, and even in the game’s darkest moments (and it does go some pretty dark places), it never forgets to take the occasional moment out to provide some relief. On top of that, the game has a genuine mastery over giving players a sense of wonder with each new location they visit, and, again, playing this for the first time, I was ploughing through it as fast as I could as much because I wanted to discover what was coming next as anything else. Ōkami is an old game now, but it’s the perfect argument against the use of “realism” in video games. 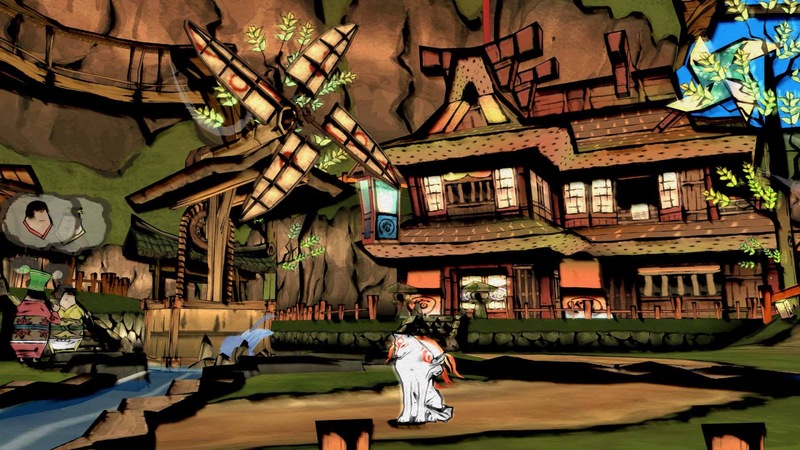 Where just about any “realistic” PlayStation 2 game you could think of has aged horribly, to the point where the developer would need to rebuild the game from scratch if they wanted to re-release it, the sumi-e/ ukiyo-e inspired art in Ōkami is timeless to the point that, if anything, the primitive polygonal design of the characters has actually been enhanced by in the HD remaster. People would probably assume that Ōkami was an indie game made by some incredible artists were it to have been released for the first time today as new. On the other hand, GTA 3, released today, would have been dismissed as an ugly, inferior clone of GTA 5. The game still plays well enough, but in gunning for realism, a developer will only ever be a new piece of hardware away from their game being redundant. 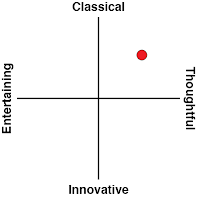 A game that focuses on art direction and aesthetics will be timeless. For another example, look at something as incredible as Shadow of the Colossus and all the work Sony’s doing to get that ready for a PlayStation 4 re-release. That HD remaster looks gorgeous now, but another generation down the track it’s just going to be dated again. Capcom, meanwhile, can continue re-releasing Ōkami on every platform with no updates beyond making sure it runs in whatever resolution is current, because this game doesn't rely on pushing hardware to its limits to look great. Related reading: If we must make the comparison to Zelda, here's our review of The Legend of Zelda: Breath of the Wild. I almost wish Ōkami didn’t have combat, though. I quite enjoy the enemy designs, and boss battles are particularly impressive. I also appreciate that the intensity of the theme requires that there be a physical threat to really establish the importance of Amaterasu as a guardian spirit, but at the same time I didn’t derive much enjoyment from the combat system, which is too busy and cumbersome for my tastes. A number of times I also struggled to follow what was even going on, because there is so much colour and energy packed into any given battle. I think back to a JRPG I am quite in love with on the PlayStation Vita, Oreshika, which also uses a ukiyo-e-style aesthetic, and I find myself wishing that Ōkami had a JRPG-style combat system. That would have helped it break away from the comparisons to the Zelda series that it doesn’t deserve, too. Despite my irritations with the combat system, Ōkami remains very playable throughout, and given the beauty and power of the rest of the game, I wouldn’t let a trifle like a slightly cumbersome and chaotic combat system get me down over the whole game. This is a real, bona fide masterpiece and is, if anything, getting better with age. Ōkami is not a “Zelda-like”, and deserves far more respect to be compared to a series that, arguably, it’s superior to.